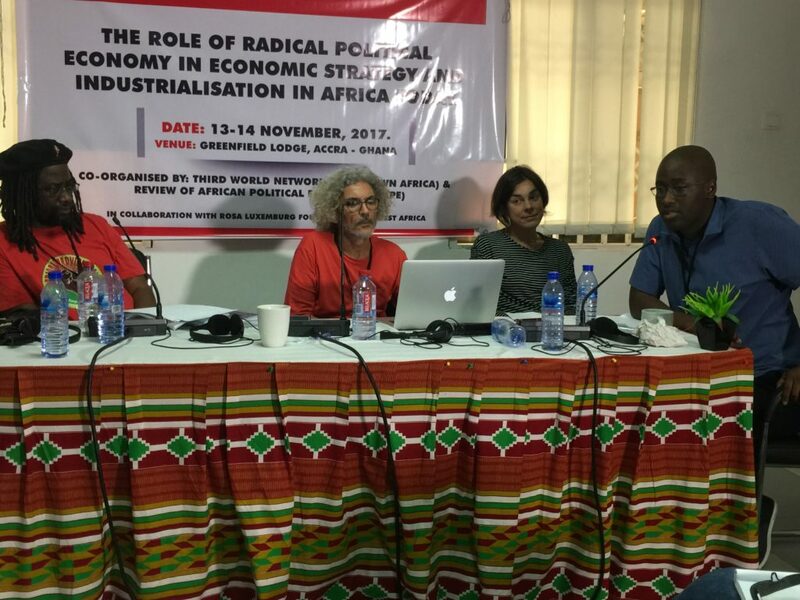 At last week’s ROAPE and TWN (Third World Network Africa) workshop in Accra, sixty activists and activist-researchers came together to discuss radical political economy and structural transformation in Africa. Over two days wide-ranging discussions and debates explored a variety of radical perspectives, on activism, resistance and research across the continent. The workshop was the first of three in Africa. The second is in Dar es Salaam in April and the final meeting will be in Johannesburg in September 2018. The workshops link analysis and activism in contemporary Africa from the perspective of radical political economy. Among the questions that were raised in Ghana were the lessons that can be drawn from revolutionary historical transitions, including the Russian revolution, and the demise of colonialism in Africa. 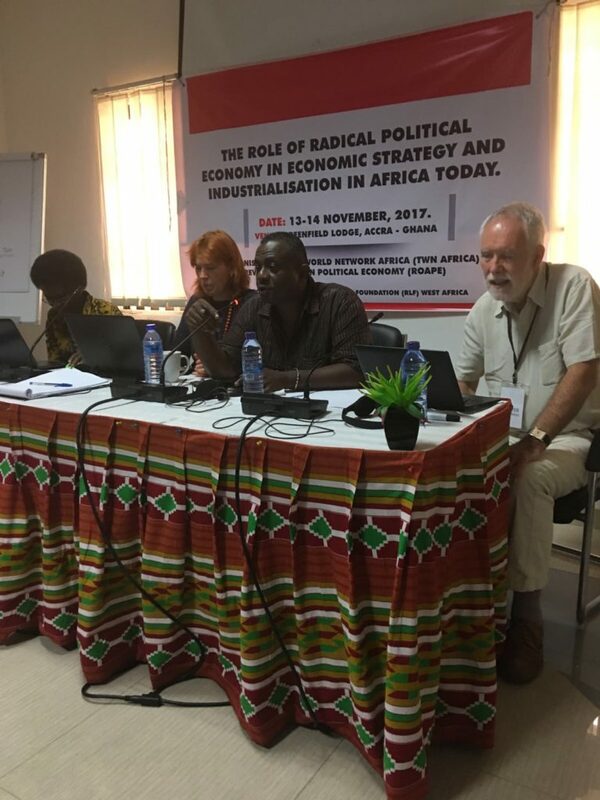 What has been the impact of limited industrialisation and the scramble for African resources on both urban and rural patterns of class formation and the potential for organising resistance? In what ways do economic crisis, land alienation and dispossession, unemployment and migration generate local resistance and what forms have resistance to the increased financialisation of globalisation taken? And what alternatives to (neoliberal) capitalist social and economic transformation are being debated in Africa? We discussed how ROAPE was set up in 1974 in the era of late independence movements. ROAPE was founded to promote support and solidarity as well as radical intellectual clout, to the militant movements and governments that emerged after the collapse of the Portuguese empire in 1974. In Mozambique, Angola and Guinea-Bissau the Review sought to support what were regarded as socialist projects in countries that had already become independent. The workshop examined the nature of the ‘world economy’ and what it might mean for projects of structural transformation. How are alternative projects for equitable and just development curtailed by this world economy? Is the concept of ‘auto-centric’ development, similar to Samir Amin’s sovereign national project, possible or desirable? Reference was made to the work, life and activism of African revolutionaries and politicians. Frantz Fanon, Patrice Lumumba and Amílcar Cabral. Each of these activists, in distinct ways, spoke of the limits of sovereignty, and how national liberation became a ‘curse’ or a ‘prison’. Each of them, focused on the role of the petty-bourgeoise leadership of the liberation struggle, frequently paralysing radical movements within national liberation. 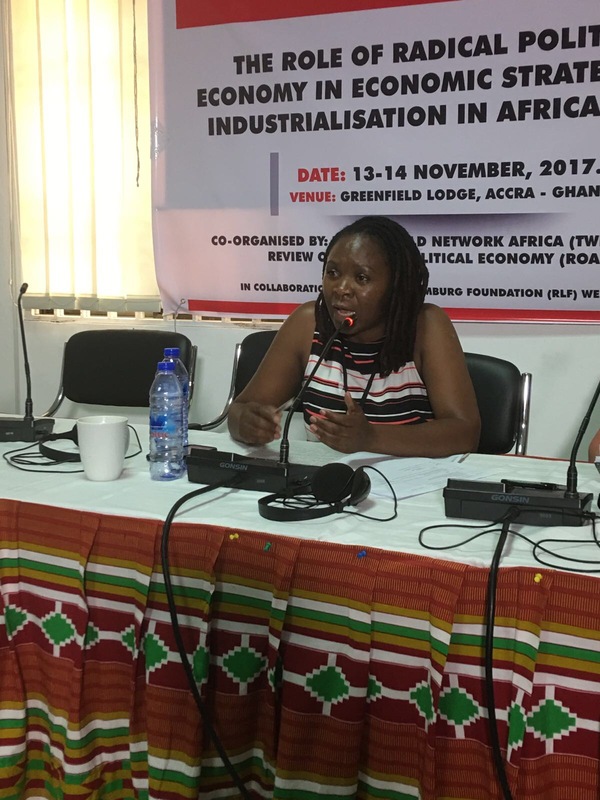 Participants also spoke in detail about the major contours of the continents’ contemporary political economy, charting financialisation, industrialisation policy, patterns of accumulation, against continuing primitive accumulation and dispossession. Speakers spoke about Chinese investment and involvement in artisanal mining in Ghana, land enclosures and agriculture in Uganda and Tanzania, and Tunisia’s post-revolution land crisis and reforms. For all of these questions, we returned to the role of the Review and our activism. Can the Review broaden its work to bring solidarity and information about struggles today on the continent? What role does the journal have in keeping a revolutionary tradition alive? And what does that (heterodox) tradition look like in the contemporary period? We spent a considerable amount of time in Accra looking at the possibilities of a new politics emerging from sites of contestation in Africa and looking both at the potential for revolutionary activity in Africa and for international solidarity in the 21st century, following the current crises in capitalism. Over the coming weeks, roape.net will be posting blogs, short interviews and comments on the workshop. We hope these posts will do two things. Firstly, continue the discussions started in Accra, and secondly, draw in other voices. Given the recent, tumultuous events in Zimbabwe, we begin by posting short interviews filmed in Accra by ROAPE’s Peter Dwyer with Tafadzwa Choto and ROAPE’s Laura Mann interviewing Munyaradzi Gwisai. Both interviews provide invaluable insight into the dynamics of protest, the political crisis and the attempts of ruling ZANU-PF clique to hold on to power even without Robert Mugabe. Tafadzwa Choto talks about the economic and political crisis in Zimbabwe, the impact on ordinary people, and some of the factors that are likely to worsen or mitigate the situation in forthcoming years. Choto is a well-known labour activist, researcher and currently director of the Zimbabwe Labour Centre. Munyaradzi Gwisai discusses the political turmoil in Zimbabwe, and the possibilities of a radical alternative emerging in the coming years. Gwisai is a former Movement for Democratic Change (MDC) parliamentarian, is a law lecturer at the University of Zimbabwe and coordinator of the International Socialist Organisation of Zimbabwe.